During a visit to Korea last year, Emory President James Wanger and Yonsei University President Kap Young Jeong announced they are working towards an agreement that expands their strategic institutional partnership. On March 23, Philip Wainwright, Emory's vice provost for global strategy and initiatives, hosted a public information session to share the results of the recent faculty survey on existing Emory-Korea connections, to engage Korea-focused faculty in discussion, and to promote exciting new developments for future Emory-Korea partnerships. Korea is one of five countries identified in Emory’s global strategy as a priority partner for strategic engagement. Among the top three most prestigious universities in South Korea, Yonsei University shares Emory’s values and deep investments in strengthening ties between the U.S. and Korea. Since 1990, faculty and schools at both universities have been exchanging students and collaborating on various projects. In 2013, Yonsei created the James T. Laney chair professorship honoring the former Emory president, who was a theology professor at Yonsei from 1959 to 1964 and later served as the U.S. Ambassador to Korea from 1993 to 1997. 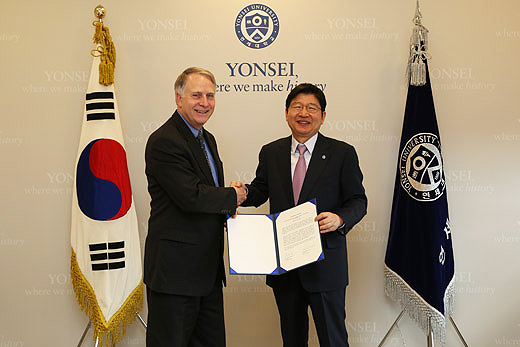 Emory President James Wagner visited Yonsei in March 2015, and in November the two universities signed a formal strategic partnership agreement to pursue mutually beneficial academic and research collaborations. The goal of this partnership is to create innovative and sustainable joint programs built around collaborative research and learning and teaching initiatives linking Emory and Yonsei. Led by The Claus M. Halle Institute for Global Learning, a key priority of Emory’s country initiatives is to strengthen and cultivate faculty ties between Emory and strategic partner institutions abroad. The partnership with Yonsei offers exciting opportunities for interested Emory faculty members to expand research and teaching into Korea and creates new opportunities to engage with Korean faculty and researchers. At the March 23 event, Wainwright announced an upcoming call for funding proposals for collaborative research projects between Emory and Yonsei faculty. Up to two projects will receive grants this first year, with total available funding of $30,000. Partners from both institutions will receive matching funds toward the completion of a collaborative research project over the course of two years. Applicants must be full-time tenured or tenure-track faculty in any discipline. A formal application will be available through The Halle Institute in April. The information session also provided an opportunity for faculty members focused on Korea to meet and network, increasing opportunities for future mentorship and collaboration and for strengthening the future of the Korea initiative. If you are interested in applying for funding for a joint research project or in serving on the advisory committee guiding the future of Emory’s engagement with Korea, please contact global@emory.edu.